After the public discovered the health benefits of cooking with olive oil, it became a standard home pantry item—but most people aren’t aware of the quality spectrum of this staple. A number of brands in the marketplace are actually blends of olive oil with less expensive products like corn oil. Others are improperly bottled in clear containers that speed deterioration, and most don’t disclose “consume by” dates. “Many people also aren’t aware that olive oil production is seasonal, and that flavors differ depending on the place of origin and harvest times—just like wine,” explains Cascone. The chemistry proves the quality of the batch, which influences its health benefits and flavor. For instance, polyphenols (which provide antioxidants and a spicy ‘bite’) are highest in a young crop, whereas a late harvest yields a larger quantity of lower quality oil. Oliva Dolce only sells oils less than one year old, and Cascone encourages customers to only buy what they think they will use in the next six months. He offers extra virgin olive oils that range from smooth to robust, and a variety of flavored oils for specialty uses, including olive wood smoked, wild mushroom and sage, cayenne chile, and blood orange (see recipe below). Oliva Dolce is managed by Moorestown native Katie Sklarow, who also runs her own catering business (Saving Thyme) and teaches Moorestown Parks & Recreation’s popular children’s culinary classes. Sklarow and Cascone are planning tasting events and demonstrations, including partnering with neighboring LaDiDa boutique for a ‘ladies night out’ of shopping and creative oil and vinegar based food and drink samples on February 9 from 6:00-9:00 p.m. Cascone is also planning some seasonal pop-up shops to increase awareness and appreciation for top quality olive oils and balsamic vinegars. Since its opening late last year, Oliva Dolce has already made an impact by embracing the community, supporting local causes and activities, and engaging in town events and cross-promotions. 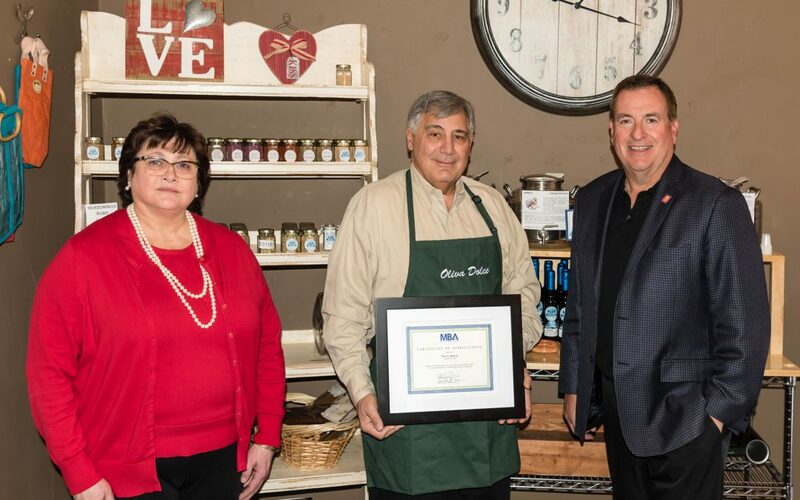 The MBA is excited to welcome Oliva Dolce to Main Street as a dynamic addition to the township’s retail scene, and applauds Cascone for introducing a unique product line that entices shoppers to Moorestown. Preheat oven to 350° and lightly grease a baking sheet. In a small mixing bowl, blend the first 5 ingredients with a fork until well mixed. Combine the milk and vanilla and slowly stir in until mixture becomes a dough. Fold in the chocolate chips or cranberries. Drop by tablespoons onto prepared baking sheet and bake approximately 20 minutes, or until lightly brown.